Macro Musings Blog: Is This Really It? (1) This upward movement in expected inflation means the Fed has already begun a passive easing of monetary policy well before the actual QE2 has been implemented. Because future economic activity influences present economic activity, the Fed is already influencing current aggregate spending by altering expectations. (2) There is still an overall downward trend for 2010. This downward trend means the Fed allowed passive monetary tightening for most of the year and it now is being reversed. There is a lot of ground to made up. (3) Nothing guarantees that this uptick has permanently changed the downward trend for 2010. As can be seen in the figure above, expectations started to recover in April by a similar amount but subsequently fell as the Eurozone mess intensified and drove up the demand for liquidity. Something similar could happen this time too as there are still plenty of problems lurking in the global economy. Moreover, we may get to the November FOMC meeting and find the actual QE2 may be much less than the market expected. Not everyone on the FOMC is supportive of QE2. This too would push expectations back down and led to more passive tightening of monetary policy. (3) Right now the change in expectations is based on the chatter coming from Fed officials. This requires carefully examining their words and determining how much influence each Fed official has on the FOMC. How much better it would be if the Fed followed Milton Friedman's suggestion outlined in his book Money Mischief and set an explicit target for the expected inflation rate. This would add more certainty than currently comes form diving the words of Fed officials. I actually would prefer--and believe Friedman would endorse it--for the Fed to target expected NGDP. But for reasons outlined by Karl Smith, I would settle for an explicit expected inflation target at this point. So is this really it? Has the Fed finally decided to get serious about stabilizing nominal spending? I hope so. I am afraid that despite recent speculation in the press and among market pundits, we did little at that meeting to settle the debate as to whether the Committee might actually engage in further monetary accommodation, or what has become known in the parlance of Wall Street as “QE2,” a second round of quantitative easing. It would be marked by an expansion of our balance sheet beyond its current footings of $2.3 trillion through the purchase of additional Treasuries or other securities. To be sure, some in the marketplace―including those with the most to gain financially―read the tea leaves of the statement as indicating a bias toward further asset purchases, executed either in small increments or in a “shock-and-awe” format entailing large buy-ins, leaving open only the question of when. There is a great deal of legitimate debate still to take place within the FOMC on the subject of quantitative easing and the pros and cons and costs and benefits of further monetary accommodation. Whatever we might do, if anything, must be consistent with long-term price stability and not add to the nightmare of confusing signals already being sent to job creators. I didn't see much value in Smith's comments. I think his story of instablity of inflation and unemployment really assumed fluctuations in nominal expenditure. To the degree that he is assuming that nominal expenture really stays on target, then the dynamics are implausible. Why does ouptut fall? And if it did and the Fed raises it again, why do prices rise? He is simply wrong that productivity shocks automatically cause appropriate changes in nominal GDP. If inflation targeting, monetary policy must act to offset them. I should have been more clear. I meant the part of Karl Smith's comments where he refers to the public's familiarity of inflation and inflation targets. I'm pretty skeptical of expectations having actual motive power - strikes me as reversing the horse and the cart. It's hard for me to get excited by what the graph shows. A couple of tenths increase might not mean anything. Draw a channel line connecting the lows, then drop a parallel line on the May high, and the channel still contains current action. And now we see a lot of corporate dis-investment. Unclear what that means, but it's hard for me to see it as positive. Have you read Fisher (Dallas Fed) speech today ? But I think he's going to get run over. The Fed is now boxed in to this, don't you think, no matter what the consequences may be. 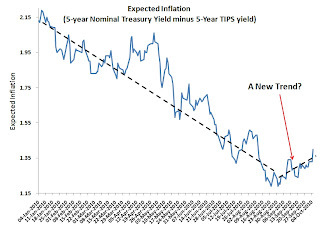 Between his speech and the better than expected jobs report today it will be interested to see if inflation expectations continue to march up. Yes, it does seem the momentum is building up toward QE2. I wonder, though, if the market might be getting ahead of itself here and end up being shocked come the November FOMC meeting. Lets use a numerical example. Would you concede that we could have 5% NGDP by either having 5% inflation and 0% real growth or 0% inflation and 5% real growth. In both cases the nominal spending target would be satisfied. Let me suppose that you accept this. Then the issue is that a monetary impulse affects prices and real output at different times. Either the two effects have to perfectly overlap or perfectly miss. Otherwise a constant sum will necessarily imply varying composition. If what you are assuming that the this dynamic never has a chance to get started then, perhaps but we are dealing with a "trembling hand" problem. The system only works so long as it never breaks and then all heck breaks loose. If we are thinking not about shocks but about trend changes then we run into a problem with nominal GDP targeting. There is a flaw in using inflation and/or inflationary expectations to boost demand: what happens if the maximum acceptable rate of inflation does not boost demand enough to bring full employment? We are then stuck with excess and unnecessary unemployment! Your error is to assume that monetary impulses impact prices or output and then nominal expenditure is determined by multiplication. Monetary impulses impact money expenditures and money expenditures impact output and prices. If prices are sticky, then money expenditures impact output more and prices less in the short run, and then prices more and output less in the long run. But if there are no money expenditure changes, then neither output nor prices change. Why do firms respond to a monetary impulse by producing more? Because money expenditures rise. The demands for their products rise. Why do they respond to a monetary impulse by raising prices? Because monetary expenditures rise. The demands for their products rise. Now, if you assume money expenditures actually remain on target, then you are assuming a cobweb based upon myopia. You do know that the goal is to keep expected money expenditures on target. Money expenditures are on target, output is too low and prices are too high. My view is that no change in money expenditure is needed and monetary policy is just right. There is no need for a monetary impulse to force output higher. You assume that prices now fall too low, which given money expenditures, makes real expenditure too high, and firms produce more, so output is too high. And then, output being too high causes firms to raise prices too high. And that makes output too low. Somehow, firms never learn to set prices just right, so that output is just right. That is, they never managing to set prices in a away that the output they choose to produce can be sold given money expenditures and they are maximizing profit. I sell 100k of ice cream every year. One year I produce 200k cones and charge 50 cents. I lose lots of money. Then, I produce 50k cones and charge $2. I could make much more money if I charged a lower price and produced more. I cycle between the two and never get to $1, 100k cones, which not only can I sell, but maximizes profit. Do you see what I find puzzling about your approach? Some "monetary impulse" made me produce 200 cones the first year, and the impulse from the year before made me set a price of 50 cents. That I will lose money with this combination is ignored. My experience that I always sell $100k worth of ice cream is ignored. Then, the impulse this year makes me produce 50k and sell them for $2 because of last year's impulse. I might lose money in this situation too, but regardless, I ignore that I can sell 100k worth of ice cream and could make money if I produced more and charged a lower price. I think that by far, having stable expectations of money expenditures will help firms in making pricing and production decisions that will avoid disequilibrium. The "impulse" story is based on the assumption no one has any idea what money expenditures will be. As for the long run trends in productivity, I think that if there is a change, then a change in the target is appropriate. I would require a 2/3 vote by congress and apply it 5 years later. Mild inflations or deflations are that much of a problem. Creating one with monetary disequilibrium is a bad idea. But a stable growth path for money expenditures has important benefits in the short run, and so, putting up with productivity driven inflations or deflations are a cost worth bearing. I sell 100k worth of ice cream every year. One year I produce 200k cones and charge 50 cents. I lose lots of money. Then, I produce 50k cones and charge $2. I could make much more money if I charged a lower price and produced more. As for the long run trends in productivity, I think that if there is a change, then a change in the target is appropriate. I would require a 2/3 vote by congress and apply it 5 years later. 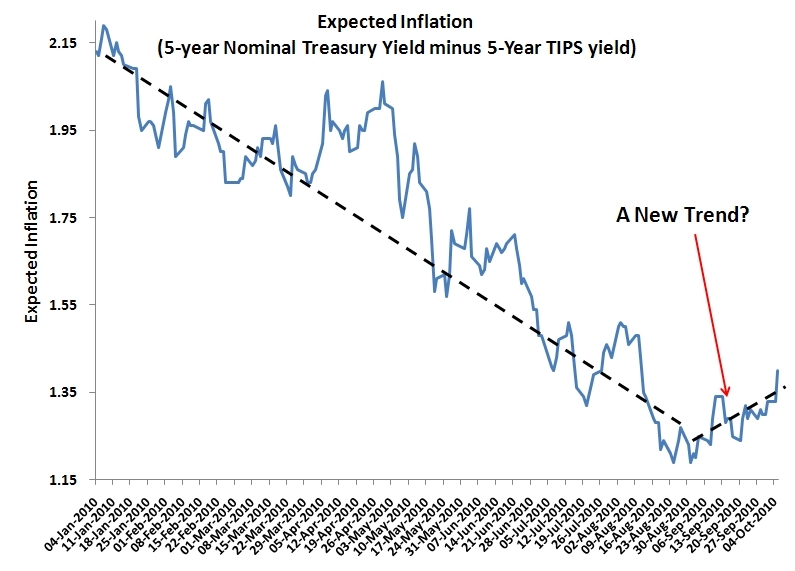 Mild inflations or deflations aren't that much of a problem. Creating one with monetary disequilibrium is a bad idea. But a stable growth path for money expenditures has important benefits in the short run, and so, putting up with productivity driven inflations or deflations are a cost worth bearing. Still, if we believe that the trend growth rate of productivity is going to be different for the next several decades, an adjustment would be appropriate.